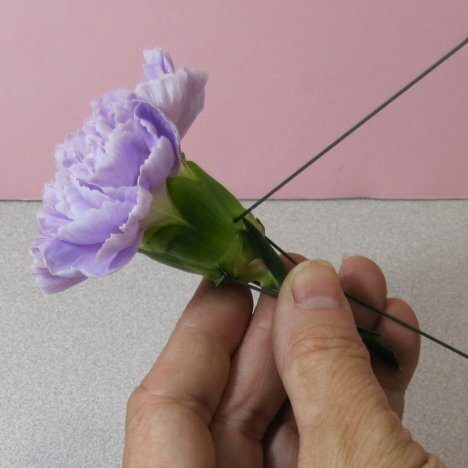 Learn how to make a boutonniere using a lavender carnation, two alstromeria and colored wire. The steps are broken down for you and not at all hard to do. 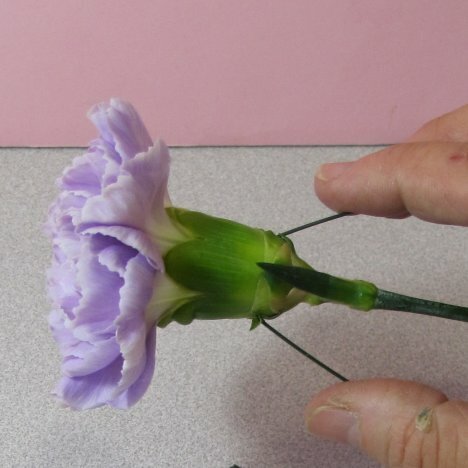 Carnation boutonnieres are easy to make. It is a very durable flower that often is shortchanged in the flower market, being scorned for being too common. 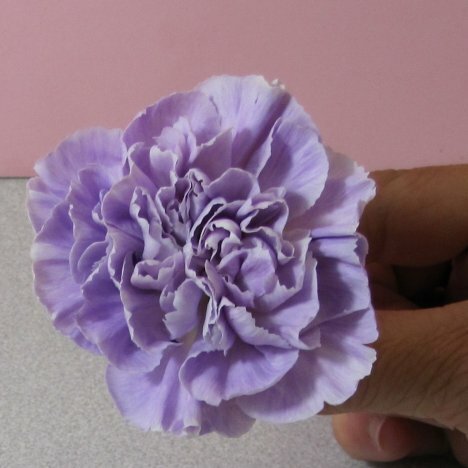 The carnation come in a wonderful array of different colors and has a light, pleasing scent. You should wire every flower that you use in both corsages and boutonnieres because it gives you more control over the flower head and decreases the dreaded "snapped head" in which a flower head is broken off at the stem of the boutonniere. I typically use a 26 gauge green florist wire in my cut flower designs. Cut it in half with a pair of wire cutters. 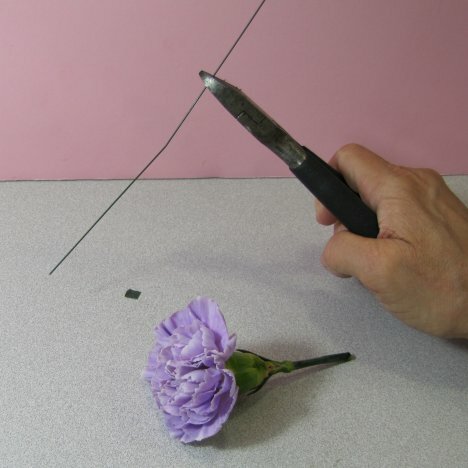 I cut my carnations stems short and allow the wire to become the flower stem. 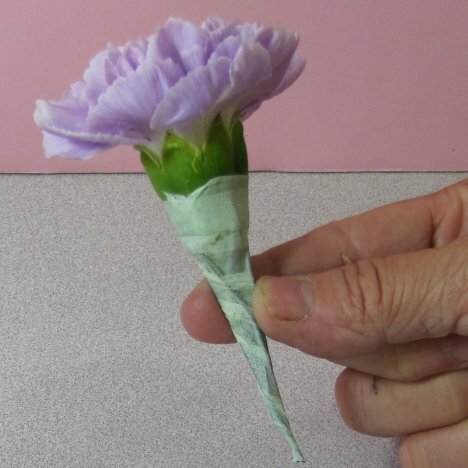 Make your own wedding boutonniere by choosing solid, firm to the touch carnations. The flower head petals should be attached firmly to the bulb of the flower and not show any transparency. Cut the stem off about 1" below the calyx (bulb) of the flower. Pierce the flower from the side using florist wire. Any heavier and the wire will be hard to bend and will make for a bulky stem. Lighter wires are harder to push thru the fresh flower without bending. Pierce completely through until the wire ends are approximately the same on both sides. 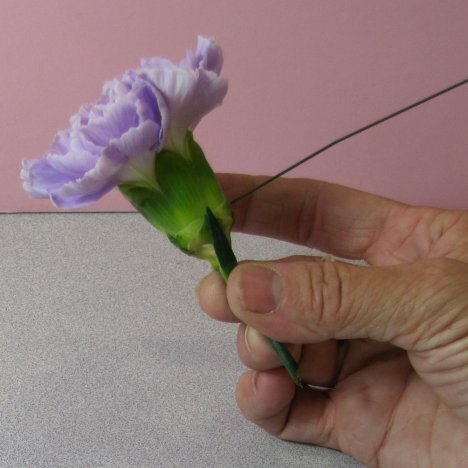 Gently bend the wire down so it is parallel to the flower's own stem. 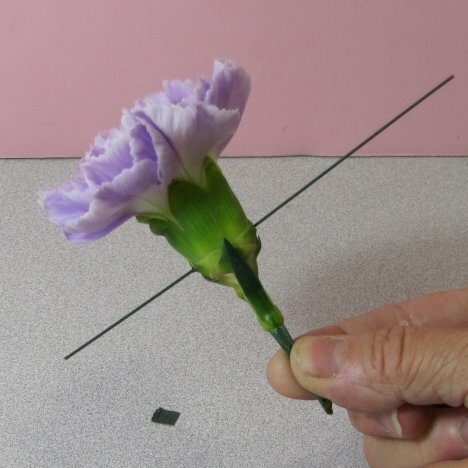 Now use another wire to pierce through the other side of the carnation head. This means there will be two wires, each on opposite sides of the same carnation. 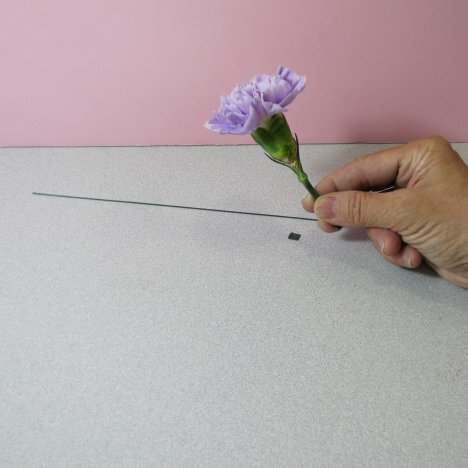 Bend this second wire down until parallel to the flower stem as well. 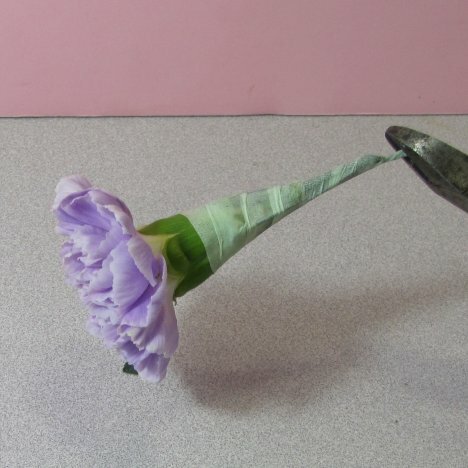 When you make a wedding boutonniere, you'll need to use green stem wrap tape to secure and conceal the wires. It is available in several different colors. I choose a light pastel green because it matches a green color in the alstroemeria that I will later add to this boutonniere. 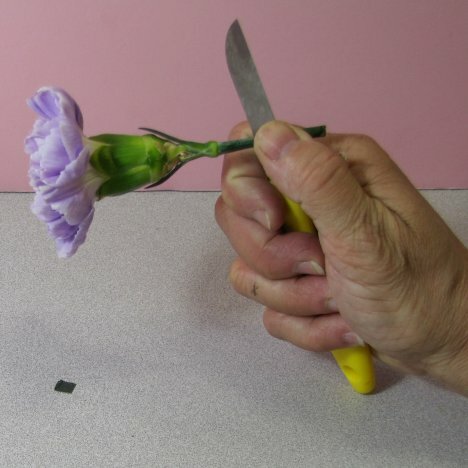 Starting at the top, pull the tape firmly around the bulb of the flower, stretching it so it adheres to itself. 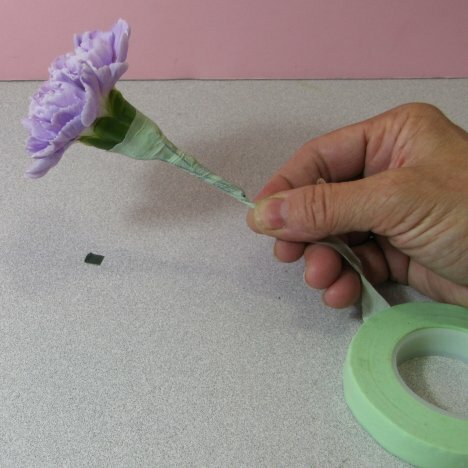 Continue to pull gently and wind the tape down the entire carnation stem. 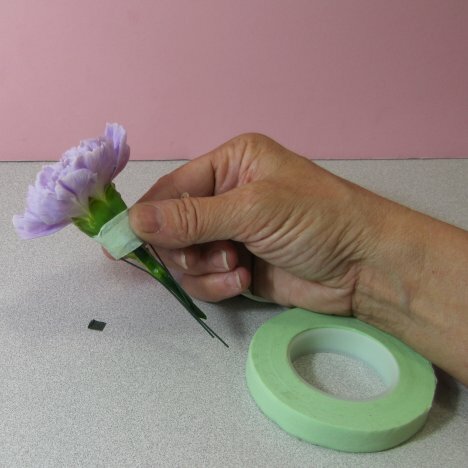 Snip the bottom off cleanly with wire cutters and give a last twist at the bottom of the wire to be sure the florist tape is securely adhered to the wire. 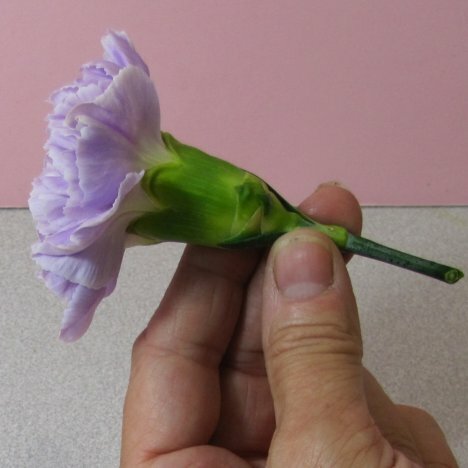 If the carnation is still only a partially opened bud, gently fluff out the petals with your fingers into a fully opened bloom. 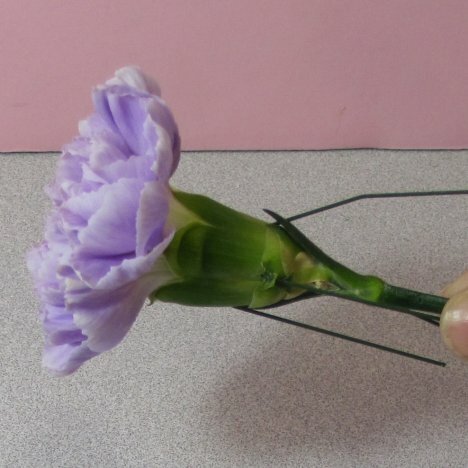 This flower will face fully opened at an upward angle in the final boutonniere design.